When mass marketers like Wal-Mart and Home Depot move into town, many small businesses become fearful for their very survival, particularly if these businesses become direct competition. Yet despite the emergence of these multi-million dollar businesses, many small businesses continue to thrive and profit in the highly competitive marketplace. 1. Provide exceptional customer service. Treat every customer as your best customer and you will be BETTER than the big guys. As a small business owner, you can concentrate on small details — every client is important, every suggestion is heard, every phone call is important. A larger company can afford to throw away clients if they complain. They may also not feel the pinch of losing three or four clients a week; since they figure that they will get them back next week – or so they think. 2. Pamper your existing customers. When the big boys and mass merchandisers come to town, now is the time to strengthen the loyalty of your existing customers. One way is to develop loyalty programs designed to increase overall satisfaction and customer loyalty. You can focus on rewarding customers who have repeat purchases, such as discounts for frequent purchases, special “loyal customer only” sales, or gifts to frequent buyers. However, it is important to realize that not all freebies will work — a free t-shirt may work for one business but customers of another business may not find it meaningful. You must choose a program that your clients would want and respond to positively. 3. Consider collaborating with similar businesses. Join with small rivals to form a ‘cluster’ that can act as one body to rival bigger competitors. Forming an alliance or partnership with other businesses, even your rivals, is one of the best ways to level the playing field and compete with major players without being at a disadvantage because of their superior size. As an alliance, you can harness some of the buying power of mass merchandisers by teaming up with other businesses, even just for basic supplies. This will allow you to cut down your costs and get cheaper inventory. By teaming up with other small operators, you can compete with big rivals by sharing the cost of marketing, such as getting a stand in a major industry trade show – something that you may not be able to afford on your own. Read the article “How to Cultivate Strategic Alliances and Win-Win Partnerships“. A “loss leader” is defined as a product on which you lose money but through which you also generate sales of other products in your mix. The idea is to price selected items at cost (or even below) in order to entice customers to go to your store, and then hope that these customers will buy more once they are inside the store. Another approach would be to sell a product at a loss, bundled with another that is profitable, such as offering “two for the price of one.” The goal is to entice customers in with irresistible offers, that they will buy other things more profitable to your business. 5. Develop a niche and focus on it. Big Boys like Wal-Mart or Best Buy have a little of everything; while you can have a little of most things and everything of one or two types of products. This will establish your store as the place to go when buying those items. The way small businesses can compete is to carry extensive items in one or two product areas. Specialize or focus on a narrow, deep but profitable niche. You can win against the giants by looking for gaps in the market that are either neglected or poorly covered by big companies. For example, you can be the only florist in your area that has all the supplies necessary for elegant parties — and the staff that knows how to pull it together. Read the article “How to Create a Profitable Niche for Your Business“. 6. Take care of your employees. Pay attention to your employees and treat them right. 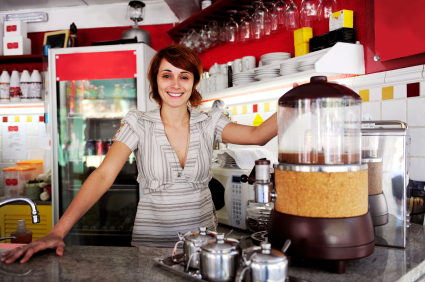 Treating employees fairly is much more crucial for a small firm. Even with the rising unemployment, finding quality personnel is not fairly easy for a small business. If one decides to leave your business, there is no reserve or pool of talent. Even with a complete staff, you may find that numerous aspects of management or operations may fall into the lap of one person, which tends to make extreme time demands on that person. Technology, now more advanced and affordable to small and large companies, provides the tools and power for small businesses to compete on an equal basis wit the big boys. It is the biggest improvement to level the field between the big and small boys. Voicemail, broadband Internet access, and two-way radios, for examples, can increase efficiency by allowing small business owners to get more done in a timely and professional manner. Computers also allow for more efficient and professional customer invoicing, job pricing, and inventory tracking. If you are still not on the Web, better start now as a website can provide you with an inexpensive, comprehensive, and professional advertising in front of your customers. 8. Present a very professional image. 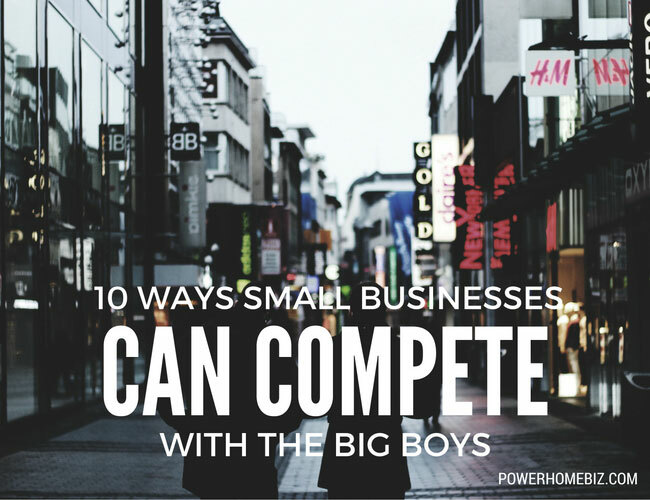 Small firms competing with big businesses will find that first impressions are vital. Image is crucial to winning the trust of potential customers and retaining the ones that you have. You must be professional, even if you are working from your kitchen table. Professionalism should be seen from every aspect of your business — from the way you dress, answer the phone, or design your business cards. Plus, always give the impression that your business is thriving, well established and efficient. Many customers do not mind that they are dealing with small specialist firms; as long as the business has the credibility that they are looking for. Think big and chances are your customers will too. 9. Emphasize the uniqueness of your products. People are often attracted to the idea of getting something unique from a smaller, independently owned business, but are used to the larger selection a chain store can offer. In your marketing and advertising messages, highlight the originality of your stock as compared to the universal stock a chain store offers. 10. Give your store character. Most big retailers have the same look, often impersonal, in every city. Make your store stand out by giving it an inviting character. Make shopping in your place relaxing. Greet customers as they enter the door, and let them know that you and your staff are nearby if they need any help. Never let customers wander around the store not finding what they need and no one to help them. When a big boy moves into town, don’t be afraid. You may not be able to fight big rivals on their own ground because you simply don’t have the resources; but you can often steal a march on them by being more agile, creative and committed. George – Excellent advice. While small busiensses cannot compete with their large competitors on scale and size they do have unique advantages that can help them change the game and compete in other ways. Developing niche, establishing personal relationship and providing excellent customer service are great ways to establish your presence in the local community and not only survive, but thrive. It is not my first time to pay a quick visit this web page, i am browsing this site daily and take good facts from here daily. One of the outstanding items I’ve seen this week. Lovely website, it loads very quick and appears really cool. Good facts. Enhances courage to face the big guys. I think this site holds very wonderful written written content posts. Awesome things here. I’m very happy to look your article. Thank you so much and i’m looking forward to contact you. Will you please drop me a mail?